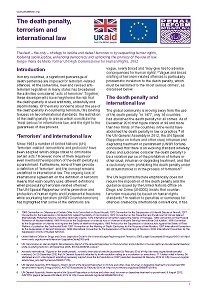 The death penalty is retained for terrorism offences in many countries, but how does it conform with international standards? The global community has had much to say about both terrorism and capital punishment; this paper brings together the key arguments to identify the appropriate state responses in the face of terrorism. This report looks at how Kazakhstan can meet its human rights obligations while countering terrorism and maintaining the security of its people.